How Does Botox for Migraines Work? What Is Evidence Supporting Botox for Migraine? What Are The Potential Downsides To Botox For Migraine? Botox – famous for smoothing out wrinkles on the face – was approved by the FDA to treat chronic migraine headaches in adults. In a quick, in-office procedure, patients receive a series of injections at specific sites on the head and neck, to decrease the severity and frequency of future migraine attacks. First response can be considerable (a decrease of 8 days per month in chronic migraine). Further response and even greater improvement may develop with repeated doses over time. The interval between Botox treatments is about 12 weeks. Botox is Botulinum Toxin Type A. It is a neurotoxin used for greater than 20 years and is currently FDA-approved for chronic migraine prevention, as well as multiple other medical conditions (cervical dystonia, upper limb spasticity, strabismus, blepharospasm). For complete product and prescribing information, go to www.botox.com. Botox works in a complex manner. The mechanism of action is related to the interruption of signal transmission by the nerve cells to the muscles. Botox produces muscle fiber paralysis by disrupting the normal functioning of the neuromuscular junction. Botox blocks the release of acetylcholine, a neurotransmitter, from the nerve cells. This inhibits muscle contractility leading to paralysis of the muscle. The effect occurs after an average of four to six days and persists for an average of three months. The neuromuscular blockade is always reversible, even after years of repeated injections of Botox into the same muscles. While the most well-documented effect of Botox is the science behind muscle fiber paralysis, other biological effects may also be involved in the decrease of migraine pain, such as a potential decrease in inflammatory mediator release. These additional proposed mechanisms are currently under investigation. WHAT IS THE EVIDENCE SUPPORTING BOTOX FOR MIGRAINE? The FDA approved Botox for chronic migraine based on the results of two studies, PREEMPT 1 and PREEMPT 2. These studies, published in the March 2010 issue of Cephalalgia, and involving 1,384 adults in North America and Europe, demonstrated that patients treated with Botox experienced a major decrease in the frequency of headache days. Specifically, the studies showed that Botox (OnabotulinumtoxinA) was statistically significantly superior to placebo for the primary endpoint, frequency of headache days per 28 days relative to baseline. In those patients receiving Botox, there was a significant reduction from baseline in both headache and migraine days, cumulative hours of headache on headache days and frequency of moderate/severe headache days. It was safe and well tolerated, with few treatment-related adverse events. Few patients (3.5% Botox/1.4% placebo) discontinued due to adverse events. Botox was also significantly favored in all secondary endpoint comparisons. Based on the strength of this evidence, the FDA approved Botox for the treatment of Chronic Migraine Headaches in adults. Cost – Despite its proven benefits, Botox is relatively expensive. When used cosmetically, the current Botox price in the Denver area varies from $10-$18 per unit, depending upon the services received. In contrast to cosmetic uses of Botox, studies indicate that larger amounts (100-155 Units) are required for optimal Migraine prevention. With the FDA approval of Botox for the treatment of Chronic Migraine, many more people are able to afford the treatment, when these services are covered by their insurance company. See our current botox pricing. Cosmetics – Many patients may notice a temporary smoothing of the appearance of moderate to severe facial lines. However, cosmetic benefits are not the primary purpose of Botox treatments when injected for Chronic Migraine. The specific sites injected are designed to achieve the goal of migraine prevention. To achieve optimal cosmetic results, additional and different injections may be required. While you may be able to combine treatment goals, it must be done correctly. Botox is a powerful biologic toxin – too much Botox at any one time, or too short an interval between Botox injections may result in poor outcomes. Make sure to tell your doctor if you are already receiving cosmetic Botox treatments, and are interested in Botox for both migraine prevention and cosmetic benefits. Side Effects – The same formulation of Botox was approved by the FDA in 2002 for the treatment of facial frown lines, and no new side effects have been identified. As with any injection, there is a risk of some bruising, swelling and pain at the site of injection. The most common adverse reactions reported by patients being treated for chronic migraine have been neck pain and headache. People with neuromuscular disorders, such as Myasthenia Gravis, Lambert-Eaton Syndrome, or ALS, may be at greater risk for side effects. The drug also can cause muscle weakness, double vision, blurred vision, drooping eyelids, loss of bladder control, and hoarseness. The label includes a “boxed warning” regarding the potential spread of the medication beyond the site of injection. Within the use of Botox at recommended doses for the treatment of migraine, no definitive serious adverse events have been reported. For a copy of the package insert, go to: http://www.allergan.com/assets/pdf/botox_pi.pdf. Suffer with headaches more than 15 days a month. Have had difficulty tolerating several preventive medications (e.g. Topiramate, Nortriptyline, Beta blockers, Calcium Chanel blockers). Prefer the convenience of simply coming in for Botox every three months rather than taking a daily preventative. 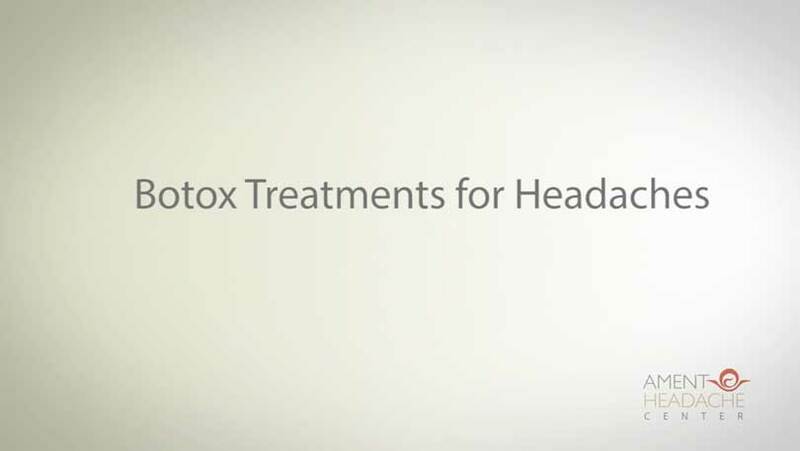 If you are currently frustrated with your headaches, then Botox may be a consideration. Make an appointment to review your headache history and see if you may be a candidate for Botox for migraine. This determination is made jointly between you and Dr. Ament, after evaluating your unique situation. If Botox makes sense, most requests can be accommodated within two weeks for direct pay clients, and four to six weeks for those interested in utilizing insurance benefits. Your office visit for Botox injections takes a total of 30 minutes. It is not necessary to have anyone drive you to or from your appointment, and you may resume your normal daily activities immediately after you leave the office.